Saudis Deny Reported CIA Conclusion That Crown Prince Ordered Khashoggi Assassination The CIA found "nothing of this scale, an operation like this, could possibly have happened without the crown prince knowing about it and authorizing it," The Washington Post's Shane Harris told NPR. Saudi journalist Jamal Khashoggi was last seen visiting Saudi Arabia's consulate in Istanbul on Oct. 2. The CIA has concluded that Saudi Crown Prince Mohammed bin Salman ordered the killing of outspoken Saudi journalist Jamal Khashoggi, according to media reports. Washington Post journalist Shane Harris, who was part of the team that broke the story on Friday, told NPR's Weekend Edition that the CIA drew its conclusion from "a number of different streams of intelligence." Saudi officials have denied that the crown prince had any role in Khashoggi's death. And a brother of the crown prince who is mentioned in the story as having had contact with the journalist denied and challenged the report on Twitter on Friday. The CIA wasn't just factoring in audio from inside the Saudi Consulate in Istanbul, where Khashoggi walked in to obtain a marriage license and never walked out. "You also have intercepted phone calls, including one quite chillingly that we understand came from someone who was a member of that hit team inside the consulate, phoning back to a senior aide to the Crown Prince Mohammed bin Salman saying, essentially, the job is done," Harris said. The CIA also used a phone call between the prince's brother Khalid bin Salman and Khashoggi to reach its conclusion, the newspaper reported. Additionally, the agency assessed how the Saudi government functions, Harris said, "and their conclusion was that nothing of this scale, an operation like this, could possibly have happened without the crown prince knowing about it and authorizing it." Speaking to reporters on Saturday, President Trump said he has spoken to CIA Director Gina Haspel about the agency's findings. The president said the CIA hasn't "assessed anything yet," and said a report would be coming early next week addressing "who caused it and who did it." However, as The Washington Post reported on Saturday, the president has already been shown evidence of the crown prince's alleged involvement in Khashoggi's death, and according to unnamed aides who spoke with the Post, he remains skeptical. According to the Post, aides said the president "has also looked for ways to avoid pinning the blame on Mohammed." President Trump on Saturday emphasized that Saudi Arabia was "a truly spectacular ally" in terms of business and economic development. In an interview with Fox News' Chris Wallace that aired Sunday, Trump said that he doesn't know if the crown prince lied about his involvement. "You know, who can really know?" Trump said. "But I can say this, he's got many people now that say he had no knowledge." Trump said he refused to listen to a recording of the killing shared by Turkish President Recep Tayyip Erdogan. "Because it's a suffering tape, it's a terrible tape," Trump said, "I've been fully briefed on it. There's no reason for me to hear it. ... I know everything that went on in the tape without having to hear it. ... It was very violent, very vicious and terrible." The Turkish government handed audio recordings of Khashoggi's killing to the United States and other countries. "We gave them the tapes. We gave them to Saudi Arabia, to America, to the Germans, the French, to the British, to all of them," Erdogan said at a news conference in Ankara, Turkey. Regarding the crown prince, who has a close relationship with Trump's son-in-law, Jared Kushner, the president said, "As of this moment, we were told that he did not play a role, we're gonna have to find out what they say." That contradicts what Harris told NPR. "We should note, too, that the president has been briefed on the CIA's findings and what we understand is that he keeps resisting them because he doesn't have, I guess, the smoking gun. He keeps asking, 'Well where is the body?' or 'show the me definitive proof that Mohammed bin Salman ordered this.' "
NPR has not independently confirmed the Post's reporting, which cites unnamed sources. The CIA declined to comment to NPR. State Department spokeswoman Heather Nauert said Saturday in an emailed statement, "Recent reports indicating that the U.S. government has made a final conclusion are inaccurate. There remain numerous unanswered questions with respect to the murder of Mr. Khashoggi. The State Department will continue to seek all relevant facts." She said that additional measures to hold people accountable will be explored "while maintaining the important strategic relationship between the United States and Saudi Arabia." Khalid bin Salman took to Twitter on Friday to deny the phone call between him and the slain journalist, saying the only communication the two men had was "via text on Oct. 26, 2017." "I never talked to him by phone and certainly never suggested he go to Turkey for any reason. I ask the U.S. government to release any information regarding this claim," Khalid bin Salman said in a tweet. He also said such a serious accusation should not be left to anonymous sources. Since Khashoggi's disappearance, Saudi officials have produced numerous and contradictory explanations for his whereabouts, or lack thereof. They first said that Khashoggi left the consulate the same day he arrived to get a marriage license on Oct. 2. As evidence slowly unraveled, officials then said a fistfight broke out between Khashoggi and a 15-man team that was sent to Istanbul. As a longer thread of narratives produced by the Saudi government continued to come apart, officials admitted that Khashoggi did die inside the Saudi Consulate, but distanced the crown prince from any connections to his death. "We believe he was probably suffocated. He may have been choked," Harris told NPR. 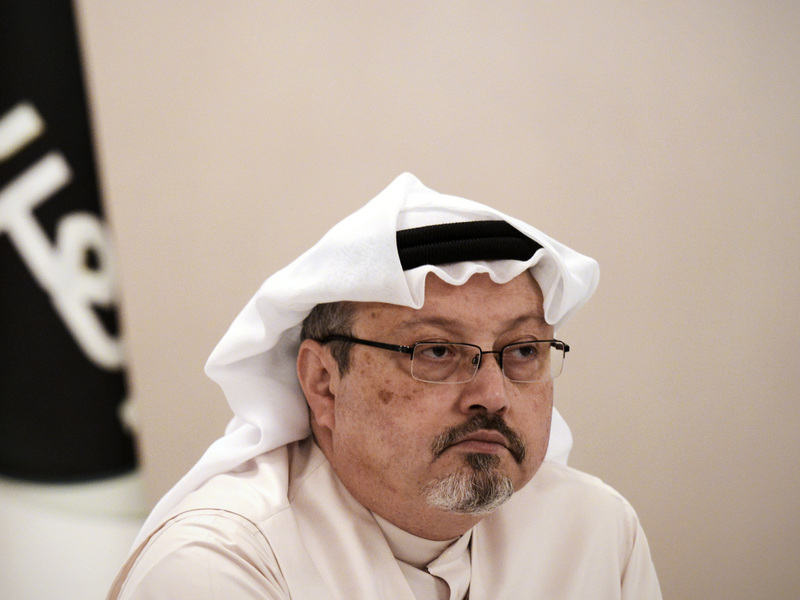 The audio from the consulate seemed to indicate that after Khashoggi died, there was conversation about what to do with his remains, Harris said. All of the men allegedly involved in the killing of Khashoggi have since been identified by Turkish authorities. As to why the crown prince allegedly ordered a hit on Khashoggi, the CIA reportedly developed a theory that Mohammed bin Salman believed the journalist was an Islamist who was nursing sympathy for the Muslim Brotherhood. The crown prince said as much to Kushner and U.S. national security adviser John Bolton in the days after Khashoggi vanished, the Post reported. In response to Khashoggi's killing, the U.S. Treasury Department announced sanctions against 17 Saudi officials, including senior officials but not the crown prince. Former U.S. Ambassador to Saudi Arabia Robert Jordan, who served under President George W. Bush, told NPR that the sanctions don't amount to a serious response. "I've said before that canceling their visas really only means they can't come to Disneyland. I think it's a token kind of sanction, and obviously there needs to be something more robust." He also said the developments will impact Trump's relationship with the crown prince. "I think it lessens the options that President Trump has to try to curry favor with the crown prince" as well as "encourages Congress to insist on more robust sanctions than we've seen at this point." Saudi Arabia's top prosecutor is seeking the death penalty for five out of the 11 men charged in Khashoggi's killing. Khashoggi's remains have not been recovered. An earlier version of this story incorrectly said Jamal Khashoggi was not seen again after going to the Turkish Consulate for a marriage license. It was the Saudi Consulate in Istanbul.